General. 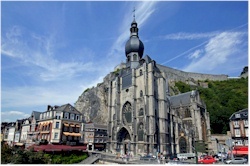 The collegiate church is unique because of its specific spire in pear shape and has become a symbol for the town of Dinant. She stands practically entirely against the rock formation behind it. This had dramatic consequences in the 13th century when a part of the rock fell down on the building. Particularities. Due to the shape of the tower, this church has a very special appearance. 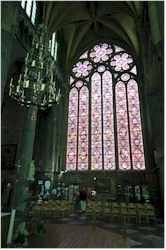 Inside you will immediately notice the Ladon stained glass window, that is one of the largest in Europe. The bust of Saint-Perpetuus is a real marvel. 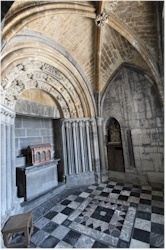 According to the legend, the saint died in Dinant in 617. 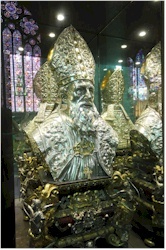 His relics were kept in a shrine inside the church. During the pillage of Dinant in 1466, the relics and the bust were stolen and taken to the rivaling town of Bouvignes as trophies of war. Afterwards they were returned to Dinant but the shrine itself was lost later on. The exquisite bust however, can still be seen and is at display in a prominent place in the building. History in short. In the 10th century, there was already a Romanesque church on this sport. That church was destroyed in 1228 when a part of the rock behind it fell on the building. It was rebuilt in gothic style but the construction of it was only finished in the 15th century. During the pillage of the town by the duke of Burgundy in 1466 the church was severly damaged and had to be repaired. History repeated itself in 1554 when the French lay siege to the town. It was not until 1566 that the typical pear shaped spire was placed on the tower. That spire was initially intended for the town hall that was built on the bridge over the river Meuse. During the First World War, the church was again damaged and had to be restored.